Iran – Isfahan, 10 November 2012. 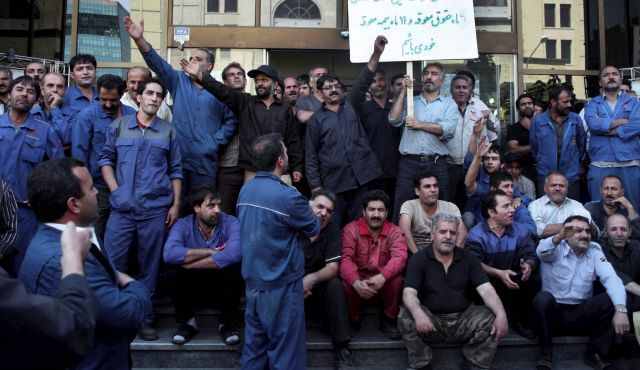 Mission Free Iran has previously covered the news of the struggle of the retired workers of the Isfahan Steel Mill and their epic victories to force the employer, the government, to pay their delayed retirement wages. The retired workers of Isfahan Steel Mill did this by making their case into a case for the entire society. They not only succeeded in mobilizing their entire families to put up a glorious manifestation of the power of unity, but successfully involved the whole of metropolitan Isfahan in their undeniably just cause against the extremely corrupt management of the mill and its retirement fund – which, due to institutionalized and integrated thievery in the Islamic regime’s economy, is now emptied of all riches and resources. The workers demanded their wages, and successfully received their then-delayed backwages, along with a written guarantee that their wages shall be paid regularly and punctually going forward. This was and is a success of enormous proportions in and of itself, even if only taking into consideration the successful mobilization and organization of enormous protests in the centre of metropolitan Isfahan, including the mobilization of all Mill retirees, their families and even supporters from Isfahan and outside, despite the regime. This represents progress in the form and organization of protest against the anti-labourer policies and practices of the Islamic regime and the Iranian capitalists. The “naturally” expected sabotages by the authorities and the employer cannot undermine its importance in showing the way for millions of others in the same situation all across Iran and in all commercial sectors. The Workers’ Communist Party of Iran (WPI) reports (reproduced below) from Isfahan that despite the written commitment by the authorities to deposit the retirees’ payments for September and October by 31 October 2012, these payments have not yet been made. Since the last protest, the retired workers have held regular weekly assemblies every Sunday and Tuesday at the retirement funds office located in Neshat Street, central Isfahan, to determine a unified approach to their common issues. They have now issued an ultimatum to the authorities. According to WPI, the Retired Workers of Isfahan Steel Mill (RWISM) published a press release on 9 November in which they have promised the authorities that unless their wages are paid by Monday 12 November 2012, they will stop all traffics to the mill by blocking the highway that connects the Mill to Isfahan, Shahrekord, and Zarin-shahr, at “Zob-Ahan Neck.” This press release has been widely disseminated among retired workers all over the region, especially in Isfahan, Falavarjan, Shahreza, Najaf-abad, and Zarin-shahr. WPI reports that today, Saturday 10 November, a number of retired workers visited the Retirement Office and in the hardest tones protested the recent delays and accused Barati, the general director of the Mill, as well as Isfahan’s governor, of being liars and cheats. MFI will update our readership on continuing developments. در اعتراضات قبلی کارگران بازنشسته ذوب آهن اصفهان به آنان کتبا اعلام شده بود که مشکلات رفع شده و تا روز ١٠ آبان طلبهای آنها پرداخت میشود. ١٠ آبان رسید و دستمزدی پرداخت نشد و بازنشستگان تصمیم به عکس العمل گرفتند. روز ١٩ آبان اطلاعیه ای از سوی کارگران بازنشسته ذوب آهن در میان بازنشستگان در سراسر استان اصفهان از جمله شهرهای اصفهان، شهرضا، نجف آباد، فلاورجان و زرین شهر پخش شد که در آن تاکید شده است که اگر تا روز دوشنبه ٢٢ آبان دستمزدعقب افتاده دو ماه مهر و آبان پرداخت نشود، روز سه شنبه ٢٣ آبان دست به تجمع اعتراضی خواهند زد و اینبار گردنه ذوب آهن که شاهراه اصلی از اصفهان به ذوب آهن، زرین شهر و شهر کرد است را خواهند بست. در همین رابطه امروز تعدادی از آنها به دفتر امور بازنشستگی مراجعه کرده و با عصبانیت فریاد میزدند که براتی، مدیر عامل ذوب آهن، و فرماندار اصفهان دروغ میگویند، ما حقمان را میخواهیم و کوتاه نمیائیم. کارگران میگفتند نامه کتبی شما برای ما نان و غذا نمی شود. اجازه نمیدهیم ما را سر بدوانید. باید فورا دستمزدها را پرداخت کنید. کارگران بازنشسته ذوب آهن روزهای یکشنبه و سه شنبه هر هفته در دفتر بازنشستگی در خیابان نشاط جمع میشوند و درمورد مسائل و مشکلات خود بحث و تبادل نظر میکنند. فردا یکشنبه نیز قرار است درمورد دو ماه حقوق معوقه و بدقولی های مسئولین بحث و تصمیم گیری کنند. کارگران میدانند که بدون اعتراض مداوم نانی به سفره شان نخواهد آمد. « Coordinating Committee to Help Form Workers’ Organizations: Preparations for Another Capitalist Attack Embedded in Social Security Organizations’ Amendment Plan!